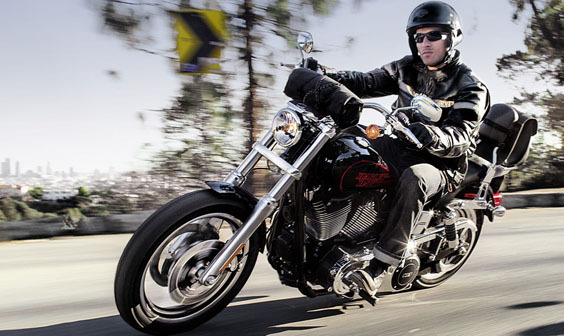 2014 Harley-Davidson Low Rider | Throttle Life! After a five-year hiatus Harley-Davidson reincarnates their legendary Low Rider motorcycle. Reborn with timeless Harley-Davidson custom cruiser style with new performance the Low Rider is primed to set free anyone who craves the taste of freedom. Rubber-mounted Twin Cam 103™ engine is rated at 99 ft. lbs. of torque at 3500 rpm. The engine is equipped with Electronic Sequential Port Fuel Injection (ESPFI) and Automatic Compression Release (ACR), and is mated to a 6-speed Cruise Drive® transmission. The powertrain is finished in wrinkle black powder coat with chrome-plated covers. Unique handlebar riser offers 2.4 inches of adjustment and seamless integration. Two-position ergonomic seat is tuned to fit a broad range of riders with a removable bolster that moves the rider 1.5 inches forward; laden seat height is 25.4 inches. High-performance perforated seat cover features a classic stitching pattern. Mid-mount foot controls are positioned to best fit most riders with an in-command riding position. Chrome 2-into-1 exhaust emits a throaty sound and pays homage to the original Low Rider. Wrinkle black console holds an analog speedometer and analog tachometer. Indicator lights are integrated into the tachometer. Chrome-plated rear fender strut covers feature wrinkle black cutouts. Chrome-plated battery box insert with wrinkle black highlights. Suspension features 49mm front forks and coil-over rear shocks, both with tri-rate springs; each tuned to deliver all-day comfort and excellent performance. Custom ignition switch located on the left side of the motorcycle. H-D® Smart Security System with hands-free, proximity-based security fob as a factory-installed option. Anti-Lock Braking System (ABS) is a factory-installed option, standard in select markets. Color choices include: Vivid Black, two-tone Brilliant Silver/Vivid Black and two-tone Amber Whiskey/Vivid Black. You can expect to see this mid-year 2014 Big Twin in your dealerships today.